After several years the plants branches from the base sometime forming very large clumps up to 1 m wide (space permitting!) but patience is required as it is also a fairly slow grower. Origin and Habitat: Chihuahua ( Los Molinos, Sierra Colorado, Barranca de Cobre, La Reforma, etc.) and Sinaloa (Mazatlan, Culiacan, El Nacimiento, Potrero de Cancio, Zapote de Madriles, Presa Huites, etc. ), Mexico. Altitude: 250-2000 metres above sea level. Habitat: Grows in partial shade of canyon walls or rocky slopes, in leaf-mould in cracks in the rocks, in foothill thorn scrubs, in low dry forest and in pine-oak woodlands. 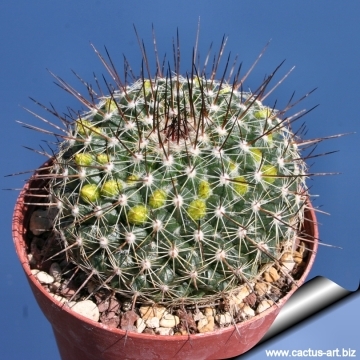 Description: Mammillaria lindsayi is solitary or cespitose cactus branching from base, sometime forming very large clumps up to 1 m wide. 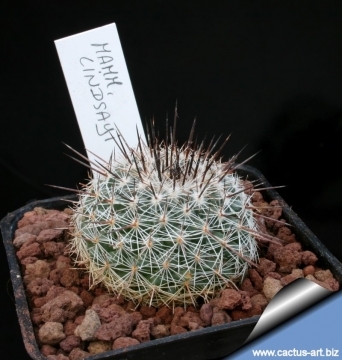 Some authors consider this species only a form of the widespread an very variable Mammillaria standleyi. Stem: Symmetrically globose, depressed, with apex that often appears completely white, grey green, 12-15 cm high and in diameter. With latex. Tubercles: Conical to quadrangular, keeled, arranged in numerous, close-set spirals. (Parastichy number 13-21) with dense white axillary wool and up to 8 white, twisted bristles. Areoles: Oval and with white wool when young. 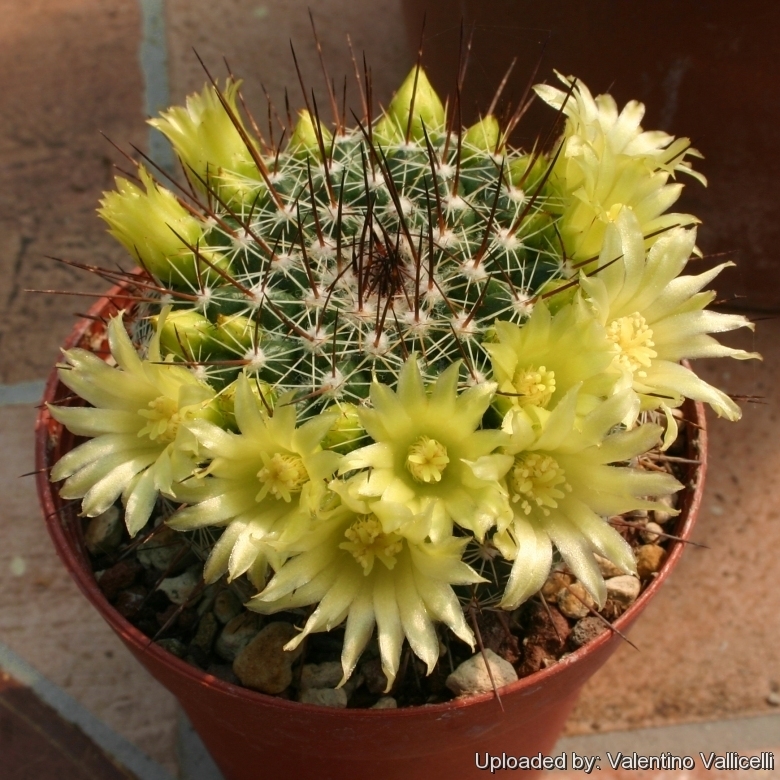 Radial spines: 10-14, white with tan to golden yellow bases, 2 - 8 mm long, upper ones shortest. 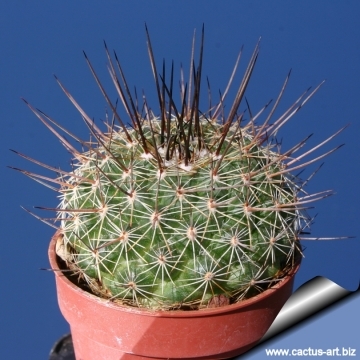 Central spines: 2-4 , straight, acicular/subulated, rigid, divergent, golden brown, reddish to almost black, the 2-3 uppermost short (approx 4 mm long) long, The lowermost longest 4 - 12 mm long (or more). 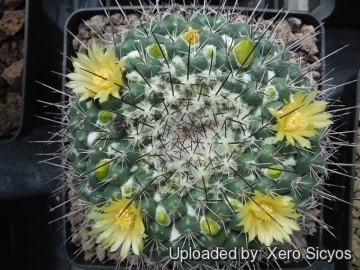 Flowers: Small, funnelform, 15 - 20 mm long, to 10 mm in diameter, light greenish yellow with orange-yellow midveins, . Fruits: Club shaped to cylindrical, attractively deep coloured dull pinkish-red to scarlet, up to 20 mm long and 2 - 3 mm wide. .
6) Burquez Montijo, A. & Felger, R.S. 2013. 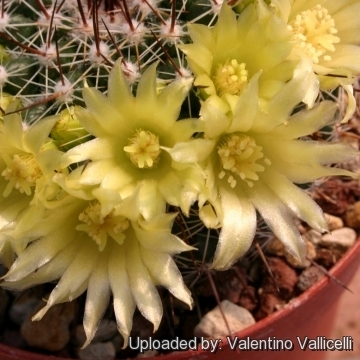 Mammillaria standleyi. In: IUCN 2013. "IUCN Red List of Threatened Species." Version 2013.2. <www.iucnredlist.org>. Downloaded on 13 January 2014. 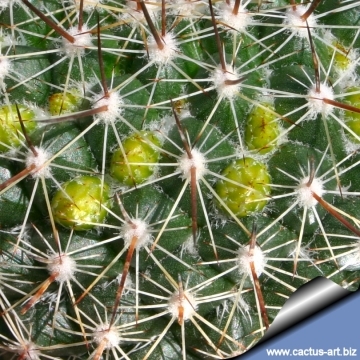 Cultivation and Propagation: This plant is easy to cultivate but very slow growing. Cultivate it in a well drained and mineral substratum. Water regularly, avoid the use of peat or other humus sources in the potting mixture. It need full sun, so it keep a compact and flat shape. It does not tolerate intense cold, but tolerates some cold if kept dry. Frequent transplantations of the young plants protect the lower part of the stem from the lignification, to which the plant has a tendency.